Am I a sheep? I ask myself that question on this grey and listless morning. (Morning? Who am I kidding? As of typing this, in two minutes it shall be NOON, my dear fashionistas. I am a lazy, lazy cow). Here's the thing: I didn't start this blog because I had any particular interest in the fashion world (I'd never been to a fashion week and assumed they were vile things filled with vile creatures: having only been to two so far, both in London, I can absolutely say hand on heart that is SO NOT TRUE, thanks mostly to the beautiful people at the BFC). I didn't 'want', 'need', of 'die for' any particular item of clothing. I wasn't 'jealous' of someone's shoes. Most of what I wore was either cheap, used, occasionally custom made (I found a great dress-maker years ago, in the Herefordshire countryside, and I'd design the Jackie O type dresses), or handed down. Sometimes, like in the case of my ex It Girl friend Nicole in NY, she'd literally borrow $100 from me and 'repay' me in discarded designer goods I did not want. I've probably posted about this before but this is one of the things she gave me (the others, I gave away, like a pair of never worn navy blue leather heeled Mary Janes by someone her mum was friends with named Manolo Blahnik). This jacket, which was so totally naff and dated at the time, with its big 70s collar and studs and bright purple leather, was designed by Claude Montana, before he was famous, from his first collection. Why am I bringing this up today? Because it seems that all 'everyone' wants is a shearling aviator jacket (and by 'everyone' I even include stylish friends who I love and respect - I'm sure there are people around the world whose wants are more basic: freedom, for example, or food, clothing - any clothing - shelter. Good health. Their life.). But as for the rest: they want a Shearling leather aviator jacket. The Burberry one, of course (specifically, the Burberry Prorsum Shearling leather jacket, shown above, left: £1895.00, or $2,961.58, but tough toodles, girls: it's already sold out. You can add it to your 'wish list' to 'see if more stock becomes available'. Even 'wish list' is a phrase that makes me cringe. Please don't get me wrong. I have nothing against Burberry - god knows, I love the brand and feel Christopher Bailey is a genius. But I bet even he is starting to feel a bit like 'hey, Dude, I'm not the Messiah. I put a girl in a lace dress and, on a whim, because I love that casual 'dress it up, dress it down' feel, I threw a Shearling and leather aviator jacket over her. I was bored with trenches, OKAY? I could just as easily have thrown a gas station attendant's greasy cotton poplar zippered windbreaker - you know the type, with the name embroidered on the breast pocket - over her delicate shoulders, and it would have worked just as well.' Actually.. not a bad idea. Are you reading this, Chris? I'm thinking, dunno, S/S 2011.. over a nice lime green silk and lace tea dress..
And yet: I love the look. 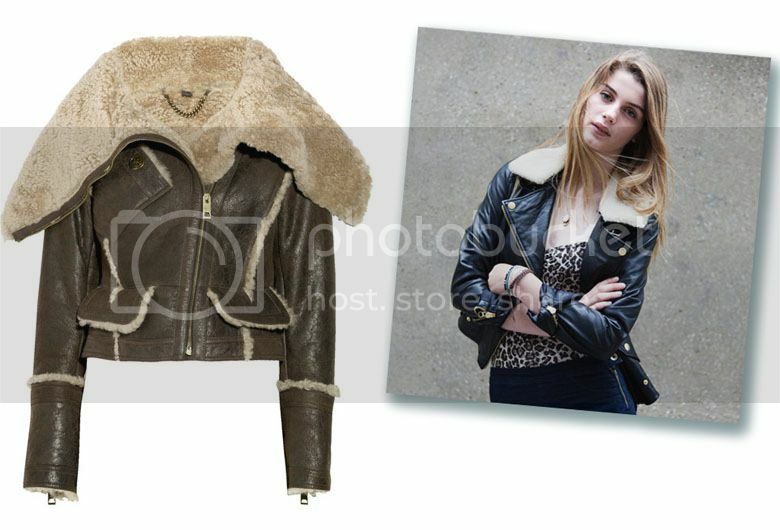 What is not to like about a masculine, tough boy's leather shearling jacket, especially over a flirty feminine dress? And I've even dug out my purple leather motorcycle jacket and thought, hmm, if I added some cotton wool dipped in tea and attached with gaffer's tape, would that achieve the same look? I'm just throwing it out there: I might, just might, be a slave to fashion. I'm not saying I can't live without it, but let's put it this way: I wouldn't kick a Burberry Shearling Leather Aviator Jacket out of bed. I might, just might, be a Sheep, after all. I'm just saying. Well, here's a comfort: ASOS is selling a very similar look, above right. Using real leather, but fake fur (okay, so a cow died to make the jacket, but at least the sheep was spared). And, at £120.00, it's not just one tenth the cost, but about one SIXTEENTH the cost. OR, I simply could wait six months, and snap up one of those BAAAd babies on eBay. Because by then, Mr. Bailey will have moved on, and so, one assumes, will we. Ah, the fickle finger of fashion. Are you a Sheep? In the meadow of life, which side of the Shearling fence to YOU stand? Interesting article! Yes that jacket is everywhere and to be honest I'm already getting sick of looking at it! Which is a shame as I think it could make a great classic item. always dreamed of having a leather sheep skin coat! preferable in Grey of course, as brown and beige are not really my colors, not flattering on pale skin, I think ha! greets! I just love this kind of jacket , I saw some sheep fur jacket in Topshop and they are lovely , I need one for the cold winter which is coming ! @ £1295.00, it's a steal! Jen I remember that's right, you did a great post on the ACNE jacket - didn't you try it on and post the shots? For anyone that's interested, I've found one on eBay that's holding @ £45, with 6 days to go. I'm watching it but really: like Grace said, I'm already feeling saturated. And I've yet to see ANYONE on the street wearing it. Granted, it's summer, but man oh man, it's f-ing freezing out there. And good for you (Grace) for being strict veggie. Now that I've discovered brands like Kate Kanzier can do gorgeous leather looking shoes and bags, I really feel like wearing leather is so barbaric. Oh boy I am a total sheep in this case, I even went to try on the Burberry he he he - they didnt have the cropped one in though. I keep telling myself my little sheepskin is just the same, but its not I want one with a great big collar from Burberry. Maybe I can get a Topshop one or maybe I will be sick of the sight of the once it is actually cold enough to wear them! Once any item/look gets hyped, it usually makes people want to look the other way. But in this case i agree with Grace...it is easily a wardrobe staple that you can go back to again and again, year after year, even after the hype has dissolved. The burberry one looks DIVINE! Completely shocked it's sold out already with that price tag.. Brilliant post, so witty and true. I have to agree with the fact that this jacket trend has gone to the extreme but it just looks too damn good to argue with. i want to say no, but i'm a sucker for leather and these jackets are just too beautiful to pass up. 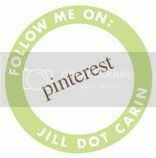 I really enjoyed this post Jill! As for me, I'll admit I am looking forward to getting my shearling jacket, but in my defence, this has been a love developing over at least since the beginning of the year! And wow, there are that my diehard fashionistas with 2000 quid in their pocket to sell out that jacket?! That's pretty impressive. 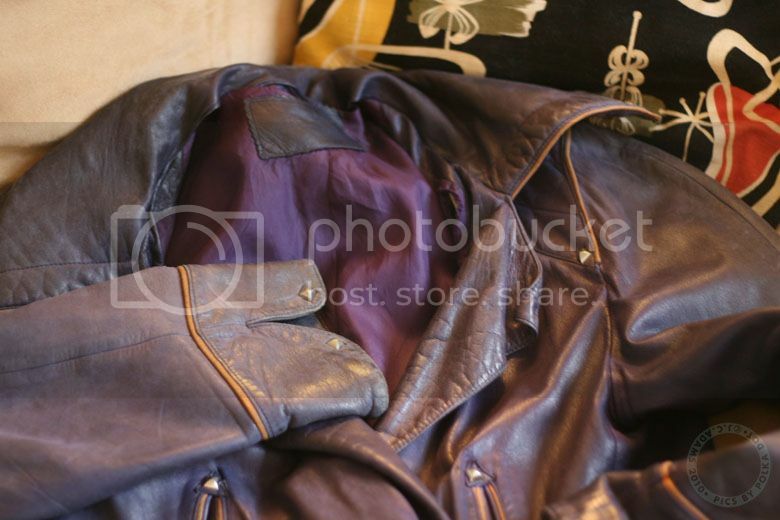 I would love to see some shearling on that purple jacket if you're up for some major DIY!